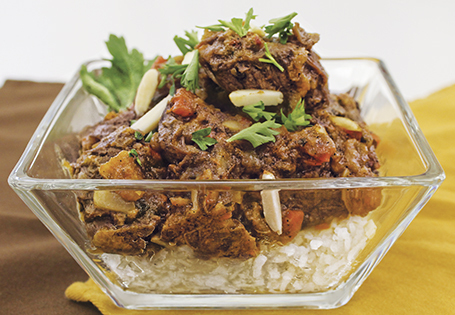 A thick spicy stew, comforting and reminiscent of the Middle East. In a medium bowl, combine the spices and ½ cup of beef broth. Add the beef and coat thoroughly. Refrigerate for 4 hours, or overnight. In a Dutch oven, combine the meat and marinade, broth, onion, carrots, garlic and apricots. Bring to a boil then reduce to a simmer, cover and cook for 2 hours. Stir in almonds, honey and parsley just before serving.